Most kites use thin sheet material for their sails. It is well known, however, that this is not the most efficient lifting surface, and aircraft wings invariably have a pear-drop cross section which causes the air passing over the top to travel further than the air passing underneath, so producing a reduction in air pressure above the wing with minimal turbulence. Aircraft use rigid structures but these would be far too heavy to fly as a kite in reasonable wind speeds. The solution is the parafoil kite, invented in 1963 by Domina Jalbert of Florida. An aerofoil shape is created as a structure inflated by wind entering vents in the front. (Jalbert's original patent is online.) Normally, no spars are used. Triangular flares sewn into the underside improve stability, to which the multi-legged bridle is attached. Some models are flown with a drogue to help stabilise them, even though this compromises the high efficiency of the basic design. Parafoils are extremly efficient and can be made in a large range of sizes by altering the size and number of cells. In the larger sizes they are capable of lifting enormous loads and need to be treated with considerable respect. Here is a good size one and here are plans for another (in French). The cross section of a parafoil is that of an aerofoil with the rounded front chopped off to form the vent. This causes drag, which can be reduced by restoring the rounded front, into which are then sewn patches of gauze or mesh to form the inlets. The upper and lower panels are often made from a single piece of ripstop wrapped over the internal ribs, and so construction is harder than for a standard parafoil. As already mentioned, crosswinds and gusts can destabilise a parafoil, in the worst case, causing it to deflate and fall to the ground. Pressure differences from cell to cell cause subtle changes in the aerofoil shape and this, together with the lack of any rigid structure, can cause variations in the angle of attack across the kite, leading to instability. These problems are addressed in a variant of the parafoil invented in the late '60s by Steven Sutton, a Canadian parachutist. His design differs in several subtle but important respects. The front vents are larger, and vents are introduced in the rear of the centre cells and the vertical ribs separating the cells, allowing a continuous flow of air through the kite. Additionally, vents are made in the upper and lower surfaces. These modifications are designed principally to equalise pressure, with the vents in the upper and lower surfaces acting as inlet or exhaust vents according to local conditions. Furthermore, the vents in the upper surface help to delay stalling at high angles of attack, making the flowform easier to launch and rock-steady in a wide range of winds. Visually, the flowform differs little from a standard parafoil, the key distinguishing feature being the vents in the rear of the central cells, which appear like a bite out of the trailing edge. In some models, this is very deep, giving the whole kite the appearance of a molar. The vents in the upper and lower surfaces can also be seen if you look carefully. 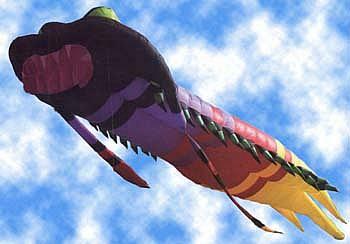 Another variant of the parafoil is the inflatable kite, in which a standard parafoil is sculptured into some "fun" shape. One of the best known of these is "Martin's legs". Designed by Martin Lester, this looks in flight like a lower torso, consisting of a parafoil with two extended cells to form the legs, which kick entertainingly in the wind. In the same vein, many other creations have taken to the sky (with greater or lesser alacrity), limited only by the imagination and ingenuity of the designer. Here's a collection of Martin Lester's body parts flying together. New Zealander Peter Lynn has long been famed for his kites of many types, from kids' kites to world record holders. Here's his Megabite His large kites webpage contains pictures of his Trilobite, as well as the MegaBite and Mega-Ray with effective areas of over 600 sq m! Some of these are so large that on a sunny day, the solar heating effect warms the air inside them so much that they hardly need any wind to fly. But what happens when your luck runs out with one of these big kites? Read about the Great Trilobite Disaster, and you won't know whether to laugh or cry! Then there was the Great Mega-Ray Disaster! A few years ago I ventured to ask on rec.kites how on earth you would set about designing one of these monster kites. I got this brilliant response from Steve Lawrie. It starts out serious but ends up highly entertaining. Plans by Bernhard Malle are available for an octopus after Peter Lynn's. Rowlands is a good source of plans and general advice on parafoils, flowforms and inflatables. Pelham and Eden also have plans for parafoils.